There is still Free Speech in this country, I think. 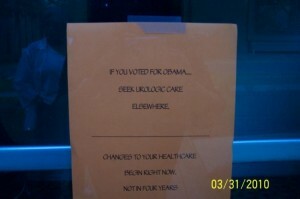 A Florida urologist has posted on his door a sign to his patients basically telling them, if you voted for Obama, you might as well seek medicial attention elsewhere now instead of in four years. In other words, cut to the chase … because the present is now. Obamacare is BAD MEDICINE. The fact of the matter is, in four years when individuals are forced off their private plans and placed on the state run Medicaid rolls … most doctors are not going to accept them any how at that point. Physicians cannot refuse patients on the basis of race, gender, religion, sexual preference or disability. However, no where does it say political preference being legally protected specified in civil rights law. All this doctor in essence is doing is flash-forwarding four years so that patients will understand the pain and the bad medicine that is Obamacare. As Another Black Conservative aptly calls it, “you reap what you sow.” Doctors will soon be opting out of health care plans because the reimbursements are too low to even do the service. Then there is the larger concern that doctors will be leaving the medical care industry altogether, according to the New England Journal of Medicine. Interesting replies to the Orlando Sentinel survey asking, Is Mount Dora urologist Dr. Jack Cassell right to want Obama supporters to receive health care elsewhere? When in doubt, VOTE ‘EM OUT! Check out this hilarious video by Ray Stevens! This doctor is entitled to his free speech I suppose, but I find it extremely odd to bring it into his practice. Is his anger so great that his care for the sick is blurred? he doesn’t want to work for free. It will probably come as a shock to the doc when the medical services community, and health care in general, actually function just fine without him. A lot of Doctors are already refusing to accept Medicaid. This is just the beginning. It will get worse when more & more doctors decide it’s not worth it to take Medicare or Medicaid as they are not getting reimbursed for their services. You can’t expect doctors to work for free. Sounds like another greedy rich person whining to hear himself. How rich do they need to be? I suppose it doesn’t matter cause greedy people always want more. I sincerely doubt that he will loose any more money than he deserves to. Sorry doc, but you’ll just have to find another way to rip off people less fortunate than yourself. Ha ha. Erik — Do you think someone should examine your pee-pee without getting enough payment to pay off med school, support his family, and eat? Bet you’d be screaming if the government decided you should take a big cut in your pay or entitlements for the rest of your life. #6- Michelle—Your post is absolutely 110% correct. This is why we also kept yelling for more Tort reform—-not enough of of which was addressed in over 2,000 pages of all the crap the Obamination just signed into law. i think doctors should take it one step further, as for patients to pay IN CASH and let them submit the claim form to the government or their insurance provider. americans will find that having the government reimburse them, rather than the doctors…will give them an appreciation of “how good we had it” before obamacare kicked in. Erik, having worked for a medical billing service, I have watched as doctors have struggled as managed health care has strangled their payments for the last 20 years. Many doctors only get paid 5-20% of usual and customary when they do a Medicaid patient and that was before Obamacare cuts. Many surgeons and anesthesiologists have malpractice insurance payments that total six figures a year – that’s before they pay their six-figure school loans. Doctors are no longer the filthy rich that you perceive them to be, so I would advise that you do a bit more research before offering anymore opinions on that which you know nothing about. This and most doctors care about money and not their patients. They are getting and will get enough under any health care plan. They are just greedy,angry,selfish people. Glad to see that political bias and greed is more important to a doctor than the hippocratic oath, which as far as I’m concerned is the reason docotr should be estatic about the new healthcare plan. If I ask a doctor why he became a medical service provider and his answer is “I wanted a new ferrari”, I’d look else where anyway. Hopefully most of the people in his town will realise that what a jerk dr cassey is and maybe even leave a letter in response telling him they did vote for obama and find a real doctor somewhere eles. I can’t believe there are still so many uninformed people. Have any of you read what this healthcare bill (law) is about? All of you who think doctors are greedy rich a-holes need to educate yourselves. Doctors provide a service and they should get paid for this service. Do you have any idea how much doctor’s have to pay for malpractice insurance? They have to pay back school loans. Many doctors go to school for way more than 4 years. What would you do without these specialists? They have a practice they takes money to stay in business. Do you expect doctors to work for minimum wage? Do you really think the government should be in charge of how much doctors make? Please educate yourselves before making an uneducated response. And BTW, good luck finding a “Real Doctor” after all these healthcare mandates are in place. He doesn’t have to provide service to anyone. That’s his right. I commend him! Well said Michelle.I’m willing to bet most don’t know what this bill is about, nor how awful the government has managed the health care systems medicaid and Medicare. The angel family we picked this year told me this story as a reason her family couldn’t afford Christmas. After hearing her story I had my doubts so decided to verify it by asking a Pharmacist, it is true. Evidently it’s common for Medicaid to only accept the higher costing name brand medication? For reasons why I have been told everything from it generates more money, allowing state agencies and their current employee benefits to not suffer a hit, to medicaid and medicare have worked out deals with some of the big pharmaceutical companies, that benefit both. If so both what? Both sides of employees maintaining bonus and vacation pay? At least I don’t think the “both” includes benefiting the taxpayers, as a taxpayer I would vote generic and start trying to climb out of this debt mess. Out of everyone I’ve talked to, not one answer has even made reference to benefiting the patient. That said, I would really like to know how many people have actually looked, in detail, to how your state is managing the current government heathcare they’re supposedly in charge of. Exactly! Which leads me to my unanswered question. With government healthcare up in the air all the above has magnified, (med students alone are becoming a rarity) yet there’s still people who drive by a doctor’s office and can’t wait for the day when, they/everyone is equal and has their right to insurance, so they can walk right in and be seen within the hour. To anyone who has stepped back and really thought about and processed the numbers are the ones pointing out the fine print details and asking all the questions. For the record a lot of those people are currently uninsured. Some pointing out there’s not a lot difference between being uninsured, unable to afford to see a doctor and being insured but without a doctor available. I bet if Disneyland opened free to the public for one day, more people would question, research, think that”s a bad idea etc than have on the health care reform.